HSBC Online Personal Internet Banking New User Account Registration Procedure apply at www.hsbc.co.in…….. Here we will provide brief instructions and also giving a Demo Guidelines on HSBC Online Net Banking Registration New User. Steps are as follows…. In that Page you can See Authenticate Yourself Box. Under that box you can choose “Registration Method” either Debit Card or Credit Card or ATM Card or Phone Banking. Then you can choose through Debit Card / Credit Card you must enter your 16 Digit Debit / Credit Card Number. Type the Issue number it can be found between your account number and the VISA logo on your Debit Card. After enter your Debit / Credit Card Pin at “Register with your PIN number” column. Click to Continue. 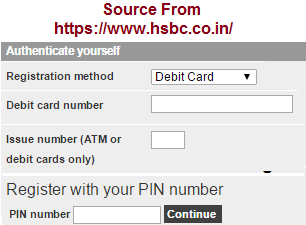 You can choose Unique Username or User ID for getting HSBC Bank Online Banking Registration. Again Click on Continue button. Then create your Login Password for Internet Banking and also create your Secondary Password. Click on Continue button. In the page you must Choose Security Questions or Hint Questions. If you can forget you Login Password the Security questions will helps you. Click on Continue button. Click on Accept Button. Then you can Select your Account Preferences and Type your Valid eMail ID. Click on Continue Button. Finally Step you must click on Confirm Button. After Successful creation of HSBC Internet Banking Online Registration you must note your Login Details on Paper or Note the details in your PC or Mobile Notes etc.